Beyond Blocks Issue #3 - Governance, Agenus' $100m STO, patient data, and more. Issue #3 - Governance, Agenus' $100m STO, patient data, and more. This week featured a lot of conversations about governance. To set the stage, governance broadly refers to the process by which we make changes or upgrades to blockchains. Will Warren, co-founder of the 0x Project, unveiled a new concept he is calling "MetaModels" at AraCon. MetaModels seek to solve an important problem: how do we govern a protocol across multiple blockchains or shards? This kind of governance will be critical for blockchain in healthcare if we want to escape the same interoperability problems that plague legacy systems. The above presentation is technical, but I'll try and break it down using 0x as an example. 0x is a protocol for exchanging tokens, which happens on all blockchains, and they are designing it to work on all blockchains. 0x could be deployed on all blockchains separately, but then when there is an update to the system you would have separate processes for updating on each implementation of 0x. How are you possibly going to keep all the 0x implementations under one set of standards in this case? If 0x updates and those updates aren't propagated to all copies of it then suddenly you lose interoperability. The problem is heightened when you throw sharding or side chains into the mix and have to deploy even more copies of 0x. Will Warren proposes the above architecture. In short, the governance process itself exists on only one implementation of 0x, and the decision made by that process are reflected in a "MetaModel," a constellation of relationships between smart contracts. All other implementations of 0x, wherever in the blockchain world they might be, are then tied to the singular MetaModel and its standards. The effect would be a single governance process, standardization, and interoperability across all implementations of 0x. MetaModels bring with them their own problems, but they are a good first step in the right direction. 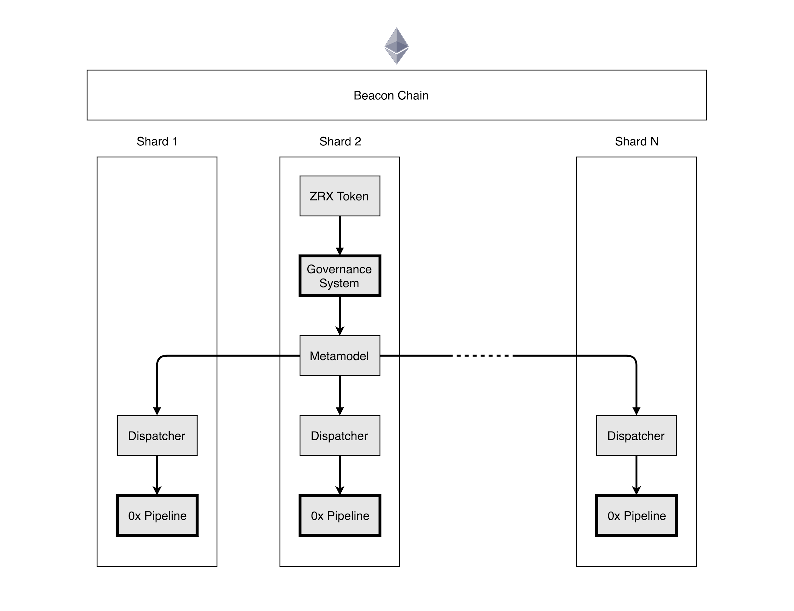 Speaking of sidechains, the Plasma Group was recently formed and just released a toolbox for deploying, transacting on, building with, or developing on plasma chains. For the uninitiated you can read about plasma as well as sidechains and how they are helping Ethereum scale here. An excellent introduction into Carlota Perez's Technological Revolutions and Financial Capital, a critical look at where blockchains are in the technology lifecycle, and some lessons for the future. Agenus, a small cap publicly traded biotech company, announced a security token offering for an asset that will represent a portion of potential future US sales of AGEN2034, Agenus' anti-PD-1 antibody. They are seeking to raise up to $100m. This is an interesting transaction for a couple of reasons. It's the first STO that I know of on this scale and from a publicly traded company biotech company nonetheless. It allows investors to get exposure to a single experimental drug instead of the overall corporate structure of Agenus and its portfolio of drugs. There are well established financing mechanisms for funding trials like this and the fact Agenus is choosing an alternative signals that they were unable to get capital from the usual sources (i.e big pharma companies). Blockchain in healthcare insurance and beyond - are we ready? Blockchain in healthcare was the subject of a panel discussion at Davos last week. A short but good interview with Mike Jacobs, senior distinguished engineer and VP of Blockchain Engineering at Optum. Platforms in healthcare are too important to leave to the control of a single or a few companies. Blockchains can help keep them open and neutral. This is a core benefit that I don't think we discuss or highlight enough. Merck announced they received a patent for a technology that "uses machine learning to link physical objects to a blockchain through their own unique identifiers or ‘fingerprints‘." Feb 8th 11 - 1PM EST - "Medication Donation for Patients in Need, Featuring Good Shepherd Pharmacy and Remedichain,"